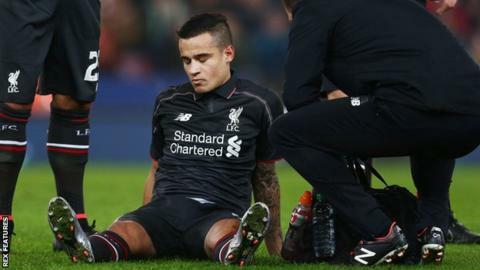 Liverpool midfielder Philippe Coutinho could be out for the rest of January after injuring a hamstring in the League Cup win against Stoke. Defender Dejan Lovren also suffered a similar injury and Kolo Toure cramp, but both have shorter recovery times. The Reds face Exeter in the FA Cup third round on Friday (19:55 GMT). "Phil's is more serious than Dejan and Kolo but none of these players will be available on Friday," said manager Jurgen Klopp. "Kolo should be available next week, Dejan will be available after Manchester United. Phil needs one or two weeks longer." Six Reds players - Coutinho, Lovren, Martin Skrtel, Jordan Rossiter, Divock Origi and Daniel Sturridge - are out with hamstring injuries. And with Mamadou Sakho also sidelined, the Reds do not have a senior central defender available to face Exeter. They have recalled two loaned-out defenders Tiago Ilori (Aston Villa) and Kevin Stewart (Swindon Town), having also recalled two more loan players, winger Sheyi Ojo (Wolves) and striker Ryan Kent (Coventry City). Is Klopp's style of play to blame? Since becoming Liverpool manager, Klopp has overseen 10 victories in 19 games, but his intense, high-pressing style of play has led some to suggest it is responsible for players injuring hamstrings. Klopp was called a "soft German" by Sunderland boss Sam Allardyce after Liverpool beat his side last month, while the Englishman blamed his counterpart for the Reds' injury crisis. Fitness coach Raymond Verheijen told BBC World Service Klopp needs to make games "less demanding" for his players, while chartered physiotherapist Sammy Margo says training may be to blame. "The instalment of the new manager is really relevant because hamstring injuries are often due to overloading, to pushing too hard," said Margo. "A large percent of injuries are brewing during training and then break out during matches. They need to look at the training and change their attitude and approach." However, German football expert Raphael Honigstein told BBC Radio 5 live he is not sure former Borussia Dortmund boss Klopp is at fault. "Because he has a big reputation as someone who demands so much from his players, a lot of pundits and media have jumped on that and said the training is too hard and they are running too hard," he said. "He would dispute that. The picture isn't clear from his Dortmund days. It could just be bad luck." Allardyce's remarks about his assessment of Liverpool's injury problems during a Talksport radio interview created plenty of headlines but he defended giving his point of view. "I gave an opinion off the question that Alan [Brazil] asked me, which was perhaps the high-pressing game in all the games that they have had created that little bit more fatigue and that was maybe a cause of why they have picked up so many hamstrings," said the Sunderland boss. "It was a question that Alan asked me, I answered it and never expected it to bring the headlines it's brought. "But if Jurgen is listening, I didn't mean to upset you or criticise your club in any way, I was just giving what I could see as as maybe one of the reasons why we get injuries." Liverpool cover an average of about 6km more per match than under previous manager Brendan Rodgers, who was sacked on 4 October, and also make about 70 more sprints. Their two most significant victories since Klopp's appointment - at Chelsea and Manchester City - came when they covered significantly more distance than their opponents. But three of the four defeats suffered under Klopp - against Newcastle,Watford and West Ham - came when Liverpool's opponents ran further. "The problem is now people speak about the intensity of my style," said Klopp. "I didn't create a style. How could I? I'm not a genius. "We play only football and a team like Liverpool and the ambitions they have... we have to find a way to be successful."